SEStran welcomes the return of the Big Tent in 2012 and the opportunity to renew our support for Scotland’s biggest green festival. This year we are again working with the Big Tent to ensure that festival goers can travel to the event sustainably. A shuttle bus service will be available, together with facilities for cyclists. People sharing their journey by car through TripshareSEStran.com get free parking all weekend. Car sharing helps reduce the event’s carbon footprint - and a full car means fewer vehicles on the roads, fewer parking problems at the event and less impact on Fife’s environment. SEStran is hosting an exhibition stall at Big Tent again this year and sponsoring a debate on sustainable transport planning. The event is an excellent platform for promoting our goal of creating a sustainable transportation system for South East Scotland, based upon making public transport the mode of choice for most journeys, while encouraging car sharing and alternative transport choices including; walking and cycling, which reduce traffic congestion, cut pollution and help improve public health. 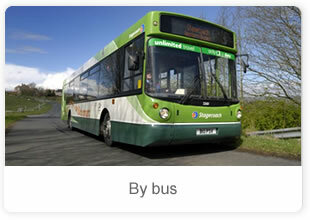 To find out more about sustainable transport, visit our exhibition stand, or log onto the SEStran website at www.sestran.gov.uk. Big Tent is located just on the edge of the village of Falkland in Fife. It's just north of Glenrothes. Dundee and Edinburgh are both under an hour. 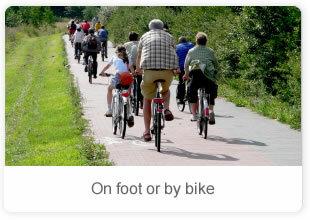 Come on foot, bike, bus or train - or tripshare! 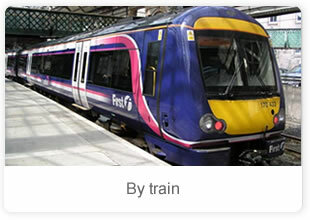 The nearest train stations are at Ladybank and Markinch. There are bus services from both stations - use Traveline to plan your journey or see the Big Tent shuttle bus service below. If you are camping and planning on coming to the Big Tent on Friday, there's regular bus services to Falkland (use Traveline to plan your journey). You need to get off at the Palace bus stop and walk through the village to the campsites. This will take you around 15 minutes. We will have meeters and greeters at the bus stops to help show you the way (and help with luggage if required). The route for pedestrians will be signed. See map for directions. When you get to your campsite you are just minutes from the main festival site. As well as the regular bus service to Falkland, we are operating a Big Tent shuttle service on Saturday and Sunday. Cost: £4 return per day. Children under 16 are free. No travelcards are accepted on these buses (if you have a travelcard you may wish to consider using the standard bus services to Falkland - use Traveline to plan your journey). Single fares back from the festival will also cost £4. Route 1: Glenrothes bus station, Markinch railway station, Freuchie, Falkland High Street (Big Tent). Buses will run on Saturday and Sunday from Glenrothes bus station at 10.00am, 10.30am, 11.00am, 11.30am, 12.00pm, 12.30pm, 1.00pm, 1.30pm, 2.00pm. 2.30pm, 3.00pm, 3.30pm, 5.00pm, 6.30pm and 7.30pm. On SATURDAY the return buses will run from Falkland High Street (Big Tent) at 6.00pm, 7.00pm, 8.00pm, 10.00pm, 10.40pm, then at 11pm and every 20 minutes until approximately 12.30am. On SUNDAY the return buses will run from Falkland High Street (Big Tent) at 6.00pm, 7.00pm, 8.00pm, 10.00pm, 10.30pm, 11.00pm 11.30pm, 12.00am. Glenrothes - Stance 16, Markinch - outside the Railway Station, Freuchie - outside the Church. As a guide only, the bus will take approximately 10 minutes from Glenrothes to Markinch and approximately 10 minutes from Markinch to Freuchie. We cannot provide exact times. Route 2: Cupar railway station, Ladybank railway station, Collessie (at main road), Auchtermuchty, Strathmiglo the Falkland (Big Tent). Buses will run on Saturday and Sunday from Cupar Train Station at 10.00am, 12noon, 2pm, 4pm. Buses will run from Falkland High Street (Big Tent) at 8.00pm, 11.30pm, 00.30am on Saturday and 8.00pm, 10.30pm, 11.30pm on Sunday. Cupar - outside of Lidls, opposite the Railway Station, Ladybank - outside the Railway Station, Collessie - bus stop on the A91, Auchtermuchty - opposite High Street on the Low Road (A91), Strathmiglo - on the A912 (Sandygates). As a guide only, the bus will take approximately 15 minutes from Cupar to Ladybank, approximately 7 minutes from Ladybank to Collessie road end, approximately 7 minutes from Collessie to Auchtermuchty and approximately 6 minutes from Auchtermuchty to Strathmiglo. We cannot provide exact times. If you are coming by train then bike we recommend you get off at Ladybank Railway Station and then use the back roads to Falkland. Sustrans have provided a helpful map for this route. Big Tent liftshare - linking passengers and drivers to car-share and split the travel costs. If you need a lift - or if you have space in your car - try the Big Tent liftshare. It’s really quick to register and you can do it through Facebook! When four of you drive together, you each quarter your travel costs (giving you more festi spending money!) - plus you help the environment. As the biggest car-share company in the UK, you’re sure to find a match with liftshare! Follow this link to find out more.